Edinburgh Napier University has introduced an MSc on Timber Architectural Design and Technology – the first programme of its kind in the UK. The programme is designed for graduates in architecture, architectural technology and other construction professions who want to become part of the growing international move towards innovative and high-performance timber building. The MSc will equip students to work as a design professional within the timber sector – one of the fastest growing parts of the building industry in many countries. The programme has been developed by Edinburgh Napier’s Institute for Sustainable Construction in consultation with professional bodies and the timber industry. Institute director Professor Sean Smith said: “Our market research shows that employers in the UK timber building sector are facing severe skills shortages and similar gaps exist in many countries overseas. “These employers are looking for graduates with a combination of technical know-how and commercial awareness in the design, manufacture and assembly of timber buildings and structural systems. We have designed the programme to address this demand. Graduates of the programme will be equipped for employment in timber product suppliers, design-build firms, fabricators, builders and developers; along with professional and technical roles in the associated architectural and engineering consultancies. The programme includes taught modules on: wood as a building material; offsite construction and design for manufacture, wood products and processing; building acoustics and sound insulation; energy performance; timber architectural form and technology, and timber building design. Students will also undertake a large architectural design project or a technical dissertation. UK and EU students on the programme will be eligible to apply for scholarships and industry internships. These are organised through the beX initiative. The programme can be studied either full-time or part-time. The complete programme will take one year full-time or two years three months part-time. The first student intakes will be in September 2018 and January 2019. For further information email TADT@napier.ac.uk or visit www.napier.ac.uk/courses and search for ‘timber architecture’. The timber building sector now accounts for 20% of UK construction and is utilised in over 70% of new housing in Scotland. The ongoing growth of this sector, both in the UK and overseas, is being driven by a combination of factors including: sustainability, emerging digital design and fabrication technologies, and an increasing demand for offsite fabrication. 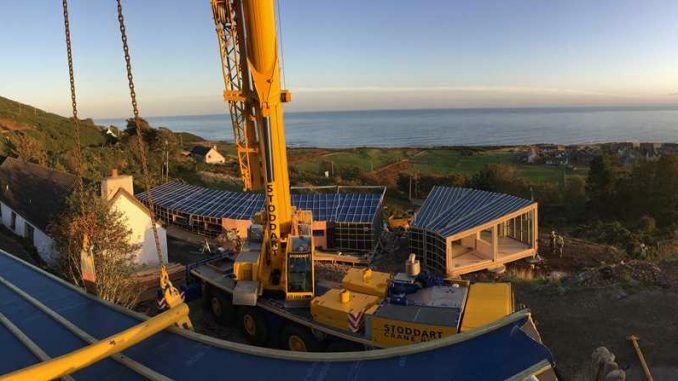 The image shows a highly insulated modular timber building being delivered to site. Photo by Carbon Dynamic.